Combine the rinsed farro and water into a medium-sized saucepan. Bring the farro and water to a boil over high heat. Reduce the heat to a simmer and cook the grains until they are tender. Check the package instructions for more specific instructions, which can vary depending on the type of farro used; mine took 30 minutes. Drain away any excess liquid. Shred the zucchinis using a grater. Drain the shredded zucchini by squeezing it through cheesecloth or a fine-weave kitchen towel. You should end up with approximately 1 1/2 cup of dried shredded zucchini. 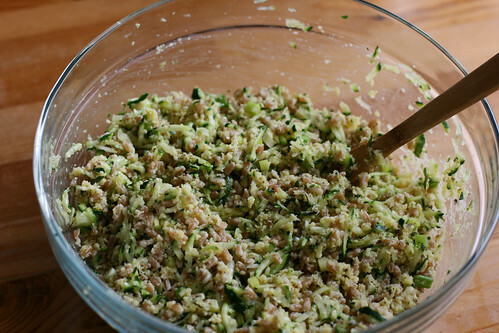 In a large bowl, combine the zucchini with the eggs, green onions, garlic, parsley, thyme, breadcrumbs, and flour. Stir well and let stand for approximately 5 minutes. Knead the mixture with your hands a few times then start forming the patties. Large patties should be about 4-inches wide and 3/4 inch thick while smaller patties should be about 3-inches wide and 3/4 inch thick. 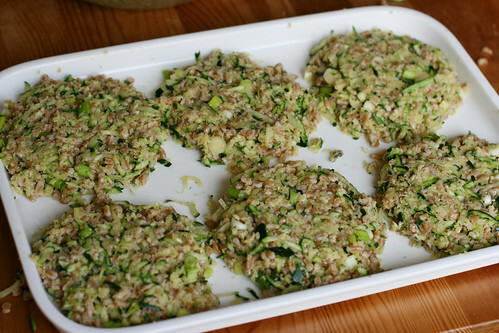 Place the patties in a shallow dish. Line a large, shallow dish with paper towels in preparation for draining the cooked fritters. Cook the patties until the bottom is golden brown, about 4 minutes. Carefully flip them and cook on the other side for approximately 3 to 4 minutes. Place the cooked fritters onto the dish lined with paper towel to drain. Repeat with the remaining patties to be served, adding extra oil to the skillet if needed. In the meanwhile, fry an egg per person. 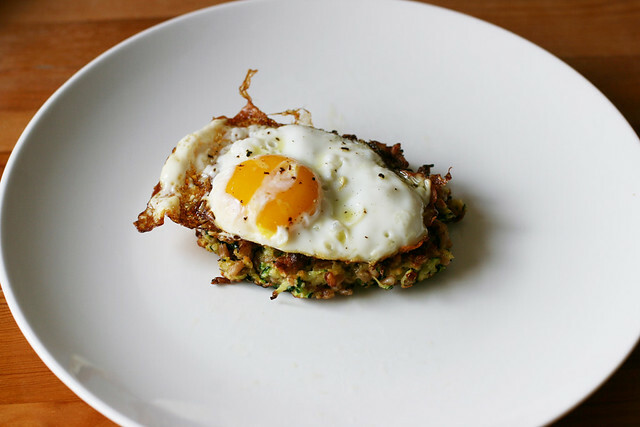 I like them crispy so I follow Deb Perelman’s crispy egg recipe. 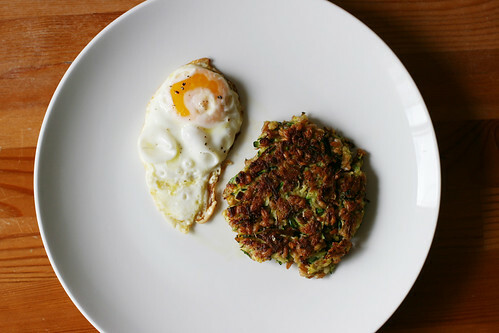 Stack one or two fritters onto each plate and top with a fried egg. Do not top with a fried egg. 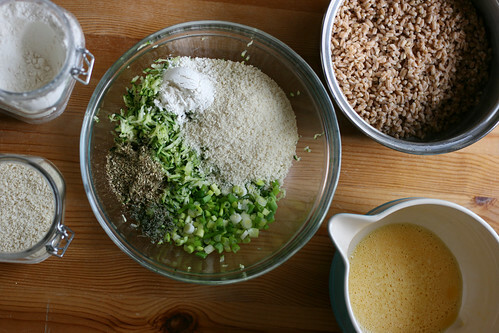 Make your own low-sodium bread and breadcrumbs. The original recipe calls for 1 teaspoon (5mL) kosher salt. Use half to season the zucchini right after shredding (combine the salt and zucchini and let sit for approximately 10 minutes before draining with the cheesecloth or towel). Use the other half when combining all mixture ingredients. If you prefer to use dry herbs instead, you can reduce the volume by a third. Use 1 tablespoon (15mL) dried parsley and 1 teaspoon (5mL) dried thyme to replace the fresh herbs. The author of the original recipe recommends replacing farro with other hearty grains like wheat berries, spelt berries, rye berries, or barley. Follow package instructions as cooking liquid amount and time may vary. The mixture (or uncooked patties) can be prepared the night before, covered, and refrigerated. Another possibility is to cook the patties ahead and later reheat them, but I’ve found it difficult to do this without ending up with overly oily or overly crispy patties the next day.